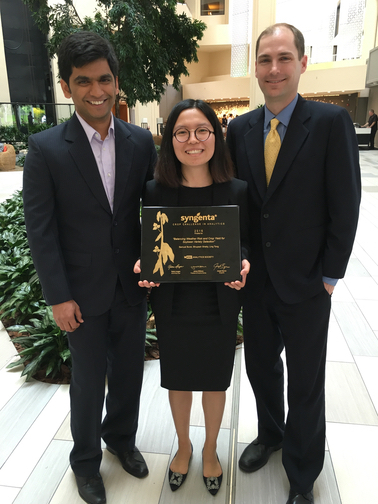 This year, in conjunction with the INFORMS Conference on Business Analytics and Operations Research, INFORMS and Syngenta sponsored the first annual Syngenta Crop Challenge in Analytics. From the University of Iowa Tippie College of Business, Ling Tong, Bhupesh Shetty, and I formed a team and entered the contest. Ling is a senior in the Business Analytics and Information Systems major, and Bhupesh is a third-year Ph.D. student in the Department of Management Sciences. Our submission used a clever mixture of data wrangling, statistics, and optimization to recommend an efficient frontier of soybean portfolios balancing expected yield and risk due to weather. We used all open-source tools such as R, Cbc, Julia, and JuMP. And…we won third place! There were a total of 36 teams from around the world, and the top two teams came from Stanford University (Earth Sciences and CS departments) and Bosch Corporation (research arm in India). Our placement was based in part on a written report and this presentation.